Graduate student assistants across the nation are pushing for a $15 per hour stipend, which they believe is a "minimum living wage." Graduate students have attributed the 29 percent stipend increase at Emory University to their successful campus advocacy. 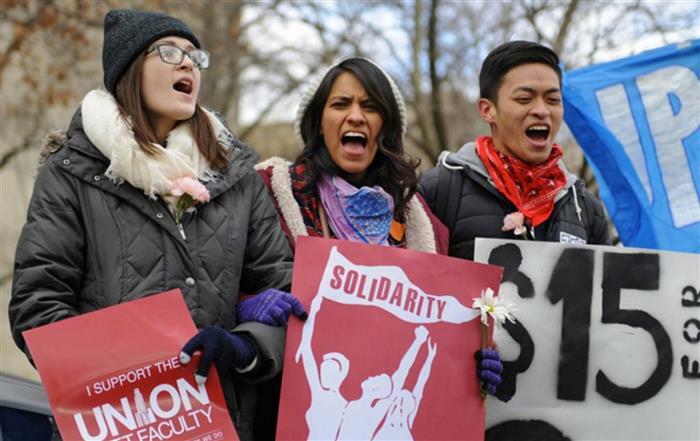 The "Fight for $15" for graduate students is maintained by the idea that they are "full-time, full-year employees, even if universities view them as part-time employees or as students learning to teach and do research." Fifteen dollars times 40 hours per week, times 52 weeks per year, is $31,000 which, "has emerged as a new target minimum annual stipend." Even on the high end of the stipend range, "it's difficult to live on a $30,000 salary and cover living and academic-related expenses "such as books and fees, according to one graduate student. While graduate students may consider themselves "full-time, full-year employees," many institutions "say they see graduate students as trainees, not workers." At many universities, graduate students are not allowed to work more than 20 hours per week; making them less than full-time employees. In your opinion, should graduate assistants be paid $15 an hour? Why or why not? There's a simple rule for raising minimum wage: DON'T. Minimum wage increases are like trying to move up a ladder by raising the bottom rung. Sure, it may look like you've gone up, but you've also moved the REST of the ladder with you, so you've effectively gained nothing. When it comes to trying to earn more, NEVER raise the ladder upward. You have to actually put in the work to climb the ladder in order to accomplish something. Honestly No, They need to get out into the real world and work for a living! The struggle is real and yes good pay comes with having experience not so much education. You can walk into a building and say I’ve got this Job but you have no experience or pior experience and you could hit a rut, you can’t lie about it! You will get caught if you do! But you can have all the education you want, but with out having the experience to do a job so simple could be devastating! It would be nice to earn 15.00 an hour! As a single mom raising two teenagers and working a full time management job and going back to school part time is tuff living on a 12.00 hour pay and I’ve got 20 yrs of retail experience under my belt and I started from ground zero making 5.00 an hour! I am sure a lot of people will have the same story or close to it! But seriously most colleges won’t let you work less than 20 hrs a week. My answer is No! Earn your way up the chain! No, because every time the government is involved things get worse. When governments raise minimum wage, then companies must raise their prices on goods and services. We see when a drastic pay raise happens, such as from ten dollars to fifteen dollars, companies fire their employees and automate. If we keep government out of business affairs, we will have more jobs, less inflation, companies that can hire the best candidates, and better pay for the workers that are the most productive.